For many city dwellers, pigeons are on par with subway delays and charity muggers: an unpopular, yet unavoidable part of city living. And that gives filmmaker Scott Harper a serious challenge as he attempts to prove that the birds don't deserve their bad rap in "The Secret Life Of Pigeons," which premieres on Thursday, November 20 at 8 p.m. as part of CBC's "The Nature Of Things." In the program, Harper aims to get viewers to change their minds on the much-maligned bird, arguing that pigeons aren't an urban nuisance but an important cog in city life, to be studied, fancied, raced, and even honoured for their contributions to humanity. Yes, you read that correctly. It helps that Harper's a veteran of documentary programming, and the award-winning Toronto-based filmmaker has tackled issues from anxiety disorders to corporate charity. But with his latest piece, Harper takes on what has to be his most difficult subject yet, promising to show us "pigeons as you've never seen them before," which, for most of us, means in a positive light. Broken up into four segments, "The Secret Life of Pigeons" kicks off with "The Nature of Things" narrator David Suzuki laying out the rough life of a city pigeon: since they rely on scavenging and humans for food, pigeons are only a few days away from starvation at any given time, and about 35 percent of the total population dies every year. From there, Harper reenacts a series of simplified experiments with the help of a handful of scientists studying the birds. And while pigeons are hardly renowned by the general public for their intelligence, the experts explore what makes pigeons so good at navigating long distances and as subjects for Alzheimer's research, as well as showing their impressive ability to recognize people who feed them and remember routine -- which helps explain why my balcony looks like a deleted scene from "The Birds" 10 minutes before my downstairs neighbour goes out with a few handfuls of bread. It also examines a phenomenon that "Seinfeld" fans are well-aware of -- pigeons' seemingly preternatural knack for getting out of the way of moving cars as a function of their ability to see the world in slow-motion. The show then backtracks to show that the domesticated birds have been relied on for a variety of important tasks throughout history, only relatively recently being dismissed as unwanted pests. Some of the segments could make for interesting feature-length documentaries of their own, like the group of 5,000-strong pigeon aficionados that make up the Canadian Pigeon Fanciers Association and run their own annual competitions, like a real-life pigeon "Best In Show." Far removed from their city-dwelling brethren, there are hundreds of breeds of these so-called "fancy pigeons," including some truly disturbing variations with giant puffed-up chests and fanned-out tails. And apparently the hobbyists can count Charles Darwin among their numbers; according to "The Secret Life Of Pigeons," the noted biologist used them to demonstrate his theory of natural selection in the seminal "On The Origin Of Species." Equally surprising are the accounts of the high-stakes world of pigeon racing, which has been hit with its own doping scandals in recent years (no, really). 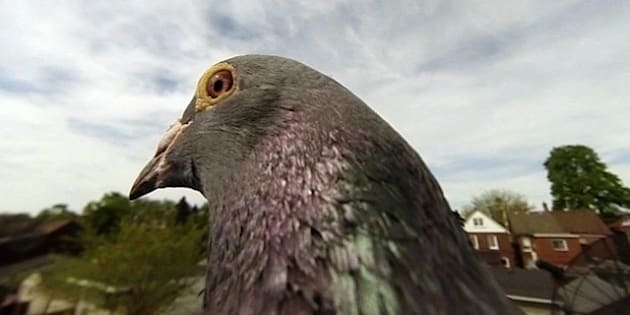 But the show's most impressive moments come when wildlife cameraman Jonathan Watts straps an HD camera to the back of a pigeon to give audiences a true "bird's-eye view" of Toronto. It's an entertaining and comprehensive overview, all in service of hopefully rebranding the misunderstood and highly-adaptable creatures that Woody Allen once dubbed "rats with wings." And while "The Secret Life Of Pigeons" likely won't have you racing out to buy a bag of breadcrumbs and find the nearest park bench, even if it just gets you thinking more critically about an aspect of city life you largely ignore, then Harper and "The Nature Of Things" have succeeded despite the long odds -- much like pigeons themselves. Watch the World Broadcast Premiere of "The Secret Life Of Pigeons" on CBC's "The Nature Of Things," Thursday, November 20, at 8 p.m. ET (8:30 NT).